Current procedural terminology (CPT) codes are used to designate services provided by healthcare professionals. 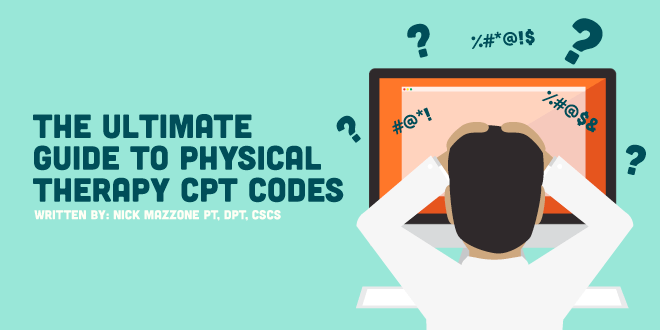 We physical therapists receive compensation for our services depending on how we bill using these CPT codes. If we don’t properly bill for our services provided, we could be losing out on valuable income. This article aims to be an useful resource for new grads using physical therapy CPT codes. While most of us got into this profession for the pure enjoyment of working with people who need our help, money still controls our profession, as it does in any other field. Now, I don’t know about you, but I sure didn’t learn much about proper billing when I was in PT school. This is one of the topics that we are expected to learn on our own as we embark on our clinical affiliations and careers. Depending on the physical therapy setting in which you practice, and the site in which you are placed, you will find that people have different opinions on what constitutes proper use of these physical therapy CPT codes. I remember my first few months of trying to figure out how to properly bill in order to please the insurance companies and meet my own clinic’s expectations. It was odd to me that there was so much widespread uncertainty involved in such a vital part of what we do on a daily basis as clinicians. How could this topic be so sensitive and debatable? Don’t insurance companies want to clearly define what procedures they will be paying for? How will I know how to bill for my patients’ time in the clinic if I don’t truly understand what the codes even mean? Those tasked with the job of creating and modifying Medicare legislation and reimbursement must have some idea of what they are doing. Payable criteria for each billing code must remain vague and undefined in order to give the insurance company the power to deny our claims if they feel our services aren’t necessary or warranted. To them, if a patient is considered “functional”, they no longer require skilled physical therapy intervention. When it comes down to it, insurance companies are businesses. Their main job isn’t to provide affordable, high quality healthcare services to all who sign up for their services. Rather, their goal is to turn a profit. The net profit of the industry over the past 10 years has equaled almost half a trillion dollars. Aetna alone reported a revenue of over $60.3 billion in 2015, a record for the company despite insurance companies sobbing over the passing of the Affordable Care Act in 2010. It would be fruitless to spend our valuable emotional energy struggling with the false idea that everyone who needs quality care will get the necessary funding from their insurance companies, especially since our patients already require so much of this energy on a daily basis. We need our private practice clinics to thrive so that they may continue to serve our communities and the patients who need us. We owe it to our profession to be knowledgeable about how to properly and legally submit claims for our services. The future of reimbursement for physical therapy services may depend on it. For the reasons mentioned above, we must make sure that we write a fairly detailed description of the interventions that fall under each billing code we are using to submit our claims. We must be able to make an argument for what we are doing with our patients so that the insurance company sees we are providing high quality care for our patients and aren’t just trying to receive as much money as possible. We must use the vague and barely defined codes to our advantage. I know this sounds tough now that many of our clinics have been forced to increase patient volume in an effort to combat decreased reimbursement rates across the board, but the extra effort is worth it. The truth is that we are underpaid for what we provide. We now have a doctoral level of education. Let’s show the insurance companies how much we know and how valuable our skillset is. Don’t let low insurance reimbursement dictate your self worth as a healthcare provider. Nobody else can provide the service we provide. The main purpose of this article is to not only provide some insight on proper use of physical therapy CPT codes, but to spark some debate on the topic among providers. I want us to air out our frustrations and help each other understand the topic by providing personal accounts and information regarding what these codes mean and the criteria for which they should be utilized. While the topic of billing can be complex, the focus of this particular article is to provide basic information every physical therapist should know about using these billing codes. In this section, I am going to outline some of the billing terminology that is useful in order to understand how to use physical therapy CPT codes. Untimed codes: The PT is paid a predetermined fee regardless of the time of treatment application or the number of body areas being treated. These codes can only be billed once per treatment session. The time spent providing these services cannot be included in your calculations of timed units and are considered separate billing codes. Timed codes: These codes are based on the time spent one-on-one with the patient and include only skilled interventions. Time includes pre-treatment, actual treatment, and post treatment time. Pre-treatment time: Includes assessment and management, assessing patient progress, inspection of the tissue or body part, analyzing results of the previous treatment, asking questions, and using clinical judgment to establish the day’s treatment. All of the contact time is administered by the PT or PTA. Intra-treatment time: Time spent providing the intervention. Post-treatment time: This includes time spent analyzing the patient’s response to intervention, educating the patient, giving advice, documentation, or communicating with other healthcare professionals on the patient’s behalf. The patient must be present during this period of time in order to include it in the time calculation. Rule of mixed remainders: This is where things tend to get confusing. Try this example: You just spent 24 minutes on exercises in which you billed 1 unit of therapeutic exercise and 1 unit of neuromuscular re-education. Now let’s say you spent an additional 7 minutes performing manual therapy and another 4 minutes using iontophoresis. According to Medicare guidelines (8-Minute Rule), you can combine this extra time (11 minutes total) into one additional unit of manual therapy since the sum of your remainders was more than 8 minutes (you bill for the service that you provided more of, hence, manual therapy in this case). However, according to American Medical Association (AMA) guidelines, leftover minutes that fall into multiple categories with less than 8 minutes per category cannot be billed for. This is why it is important to know which insurance company follows what guidelines. Now that we’ve got some of the important details out of the way, let’s start talking about what I believe constitutes each of the used physical therapy CPT codes. I have done extensive research on the topic, only to find that not much information actually exists. I will be basing the information on my research, what I feel makes sense to me, and what I have learned from coworkers and clinical instructors in the past. 97110 Therapeutic Exercise: Includes exercises for strengthening, ROM, endurance, and flexibility and must be direct contact time with the patient. Ambulation for endurance training would be included in this category (not gait training!). Most of the time, people use this code because it feels like the safe bet, however, the intervention performed fits better under the code for therapeutic activity. Therapeutic Activity tends to receive a higher reimbursement rate from insurance companies than therapeutic exercise does, even if it is only a few dollars more (it adds up over the course of a year!). 97112 Neuromuscular Re-education: Activities that facilitate re-education of movement, balance, posture, coordination, and proprioception/kinesthetic sense. You would include time spent kinesiotaping in this category as well as performing stabilization exercises, facilitation or inhibition, desensitization, ergonomic training, improving motor control, and plyometrics. 97116 Gait Training: Includes sequencing, training using a modified weight bearing status, use of assistive devices, and completing turns with proper form. If you are using this code, make sure you are focusing on the biomechanics of the gait cycle in some form or another. Having a patient walk in order to improve cardiovascular health is not considered gait training. 97140 Manual Therapy: Includes soft tissue mobilization, joint mobilization, manipulation, manual traction, muscle energy techniques (performed using resistance applied by PT), and manual lymphatic drainage. Manual resistive exercise can be included in this category or in therapeutic exercise since it requires that resistance be applied by the therapist and may be performed with the goal of improving strength or endurance. You can also consider muscle energy techniques as part of the neuromuscular re-education code. 97150 Group Therapy: PT provides therapeutic procedure to two or more patients at the same time on land or in an aquatic setting. It requires constant attendance by the PT or PTA but not one-on-one time. Medicare requires information about the type of group and number of participants in it. If you see multiple patients at one time, this is the code you should be billing for. 97530 Therapeutic Activities: Includes “dynamic activities” that are designed to improve functional performance. This may include sit-to-stand training, bed mobility, step-ups/stair negotiation, hip-hinge training, squatting mechanics, throwing a ball, swinging a bat or golf club, car transfer training, and training proper lifting mechanics. 97535 Self-Care/Home Management Training: This includes ADL training, compensatory training, going over safety procedures/instructions, meal preparation, and use of assistive technology devices or adaptive equipment. You can also use this code for teaching wound care techniques, strategies for edema control, safe sleeping positions, use of a home tens unit, traction, or paraffin device, activity modification, setting up a safe home environment, basic household cleaning/chores, and for education on the signs of infection. You can also include transfer/transition training in this code if the patient is having trouble getting up out of a chair, but not if you are using sit to stand for strengthening. As long as you are working on any of these activities with your patient’s exercise program, you can bill this code. Some of these exercises may include functional IR and ER training (dressing, toileting), fine motor skills (manipulating utensils), pelvic floor muscle exercises (for continence), sit to stand, and improving posture/deep cervical flexor endurance to ensure safe and effective swallowing. You should not be reporting that your treatments are focused on any of these ADLs if the patient has no problem with performing them or if you already included them in the count for your other codes. Teaching a home exercise program that focuses on improving ROM, flexibility, strength, or endurance falls under the therapeutic exercise code. You can argue that using a goniometer to measure joint range of motion or using manual muscle testing/ergometry would fall under this category as well since they are a piece of the “functional” puzzle, however, I have never used this code for this reason. I would use this code if I decided to administer the Berg Balance Scale (functional assessment) at any point after my initial evaluation. 97761 Prosthetic Training: Includes fitting and training in the use of prosthetic devices as well as assessment of the appropriate device, but does not include fabrication time. 97762 Checkout for Orthotic/Prosthetic Use: Includes evaluation of the effectiveness of an existing orthotic or prosthetic device and recommendation for change. Fixed rate payers: These payers reimburse using a capped daily maximum payment. Contrary to popular belief, this does not mean that they will pay you the same amount no matter how much you bill. You still need to bill for a certain amount of time in order to reach this capped maximum payment for that day. Make sure you bill for the services you provide your patient and nothing less (or more). Overusing certain codes: Insurance companies pay attention to how often providers use each billing code. If they feel that a provider uses one particular code way more frequently than other providers they deal with, they may place that provider under review (audit). Under-timing the treatment session: The time we calculate for the service we provide should include pre-treatment time, intra-treatment time, and post-treatment time. Please refer to the definitions listed earlier in this article. Using the wrong codes: This one may sound obvious, but consider this: You can make the argument that almost any exercise a patient performs can fall under the code therapeutic exercise. While this may be true, the exercise may be better suited under neuromuscular re-education or therapeutic activity. This is important because payers will typically reimburse higher rates for these two codes than they will for therapeutic exercise. Don’t leave money on the table, but also do not stretch the truth in order to receive unwarranted compensation. What questions do you have about billing? Do you disagree with any of the information above? Would you like to further discuss how we should be using these codes? Please comment below! If you are looking for more information on this topic, check out The Coding and Payment Guide for the Physical Therapist by Optum 360.